Homeless youth are not a homogenous group. The needs of this population vary based on geographic location, demographic characteristics, and homelessness history. Some research indicates that racial and ethnic minorities are over-represented among homeless youth; other studies find that homeless youth generally reflect the racial and ethnic makeup of their local community. While researchers continue to identify the characteristics of homeless youth, it is important to understand the unique needs of all homeless young people. 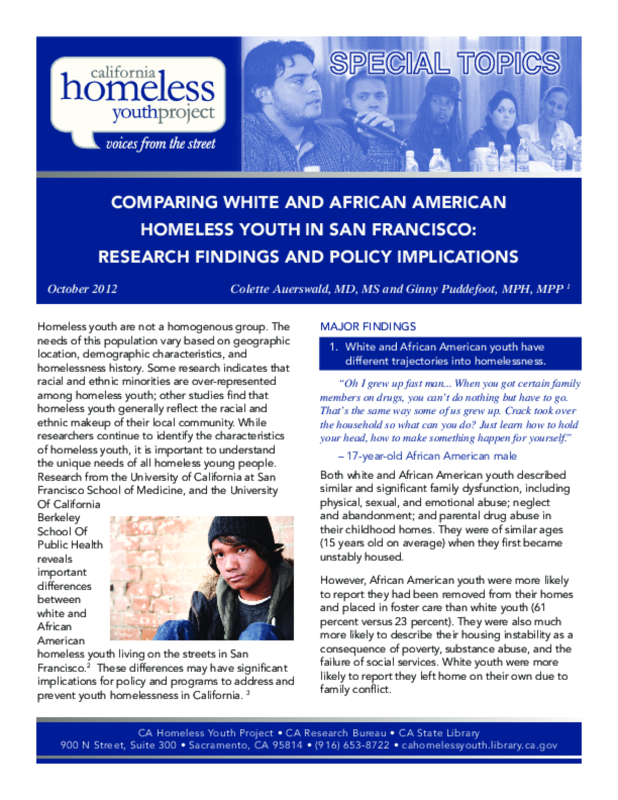 Research from the University of California at San Francisco School of Medicine, and the University Of California Berkeley School Of Public Health reveals important differences between white and African American homeless youth living on the streets in San Francisco. These differences may have significant implications for policy and programs to address and prevent youth homelessness in California. Copyright 2012 by California Homeless Youth Project. All rights reserved.